Sewer video camera inspections are often used to determine if a building’s plumbing is functioning properly. 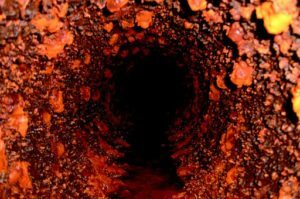 Sewer inspections can be a nightmare; luckily we have video camera sewer inspections! During this type of inspection, a cable uses a video camera which is inserted into the sewer line. This type of inspection can determine if there is an obstruction, pinpointing the blockage giving an exact location of the problem. What makes sewer inspections even more useful is their size. Because they are so small, and go right into the line, they give you the visual feedback without tearing up the ground searching for the source of the problem. Their precise feedback provides immediate payback to the alternative. Video sewer inspections will swiftly, visually inspect and diagnose many different problems with your plumbing. Initially, the diagnosis will come from your description of the problem you’re encountering. A more thorough inspection will determine the specific cause. These are the most typical problems diagnosed via video sewer inspections. Like most other problems, the longer they sit, the worse the problem becomes. And the worse the problem becomes, the more expensive it gets. The sooner you report a problem and have it inspected, the need for expensive repairs should be less likely. Wyman Plumbing has a solid reputation built on trust, knowledge, and quality dependable service to the Bradenton and Sarasota areas for over 91 years. We also have service men that have been with the company for over 20 years. Our rates are based on your job, and we keep your costs to a minimum. If you think you have a plumbing problem, call Wyman at 941-755-1595.